Come with the Australian 4x4 Tag Along Tours High Country 4wd tag along trip as we travel through this beautiful Australian region visiting some of the regions well known landmarks including Wonnangatta, The Pinnacles and Dargo, and some of those not so well known with the days drives being balanced between driving some of the easier tracks to some of the iconic High Country 4wd, low range, tracks. 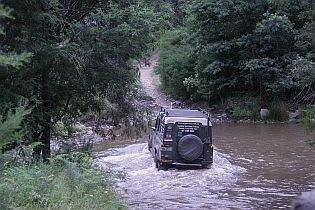 Our 4wd tag along tours are relaxed and are not full of formality. We don't sit for hours in camp either but, instead, experience well balanced days of sight seeing - we don't believe that you will find better value anywhere else. Some of the people that have been with us on these trips have come back again and again and again, all have left having experienced a memorable trip and one that they will remember fondly for many years to come. Come on an adventure of a lifetime on this 4wd tag along tour, your tour leader, John Cantrell, is very passionate about the High Country and has an extensive knowledge of the region, its terrain, its tracks and its alternative routes. He has decades of 4wd driving experience both in Australia and overseas, sometimes in very remote areas, and is one of New South Wales leading 4wd driver trainers, so if you are not that experienced and need some help and advice you are traveling with the right person. 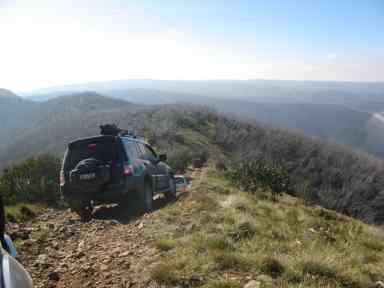 This High Country 4x4 tag along tour will be breathtaking in views with pleasant evenings camped alongside a river and daily driving that will see us viewing stunning and spectacular countryside as we alternate between driving valleys and their many water crossings to traversing ridge lines and their unique views. As we set off from Harrietville at around 8.30am on day one you can look forward to various track types, including some steep, some rough, some good, some not so good, lots of river and creek crossings, weather permitting, and stops at some of the Victorian High Country's famous and some undiscovered attractions. Not long after leaving Harrietville we will be on a gravel road and a few minutes later will be selecting low range as we prepare for our trip south, on the back tracks, to Talbotville for lunch and thereafter to our campsite beyond, but not before we encounter a steep ascent up the mountain and steep down the other side. The views only one of these tracks is amazing and will give an insight on what is planned for later on in the trip. The views on one of the afternoon tracks will give a clear perspective of the type of terrain that we have covered so far. At our campsite you can have a relaxing swim, go for a walk or simply veg out. Even though this is only day one you will have already experienced breathtaking scenery, a variety of tracks and you would have passed through historic gold mining country as well as rich pastoral land. Camp firesin the evening are part of the deal, fire restrictions permitting, and the camp site is equipped with a toilet. 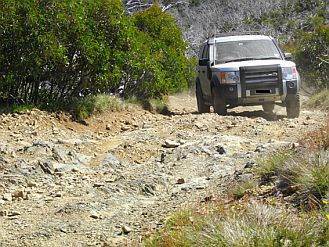 During the High Country 4x4 tag along tour we will visit the Pinnacles. This in particular, and along with the rest of the High Country, is one of Australia's "must see" destinations with Australian and international travellers alike placing them on their to do lists. 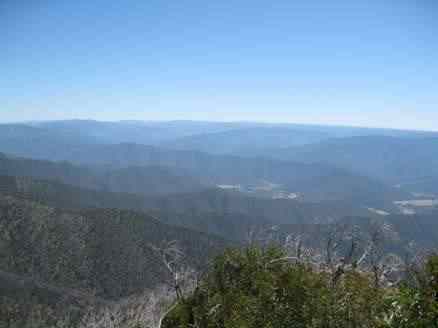 Unless have been here you just cannot imagine the incredible views over the peaks of countless mountains that spread out below you for as far as the eye can see as you stand on the observation tower on one the regions highest points. If you want to define 'breathtaking' then this is the place to do it. On our way to The Pinnacles we will experience a bit steep in places, a bit rough in others and certainly a fun track to drive. The views from the saddle three quarters up are definately worth a stop together with a few photographic shots. This drive is not untypical of the many High Country tracks that start off in valleys and make very rapid rises to the tops of mountains and, seemingly, the top of the world. 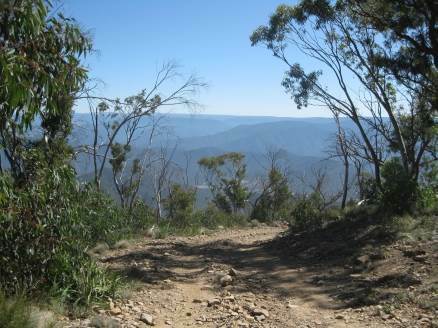 Our travels away from The Pinnacles will take us through remote country and on a mix of rugged and remote tracks, but not hard, to those that will be in good condition but steep. We will be moving towards Dargo where we have the opportunity of refueling and restocking. This is a very old town comprising the original pub with the general store and fuel supply across the road. Dargo is on the fringes of the historic Grant area which saw massive investment in the late 1800's on the discovery of gold. Most lost their money though and the town of Grant, up the hill from Dargo, was short lived. 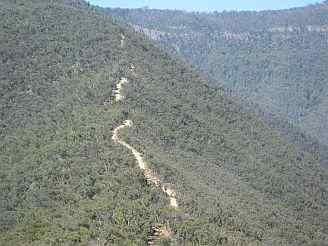 We will almost certainly visit the Wonnangatta Valley, and maybe even its historic Wonnangatta Homestead site depending on time, having wound our way through remote and steep country, also with spectacular views. On the last day of our trip, we will head back to Harrietville aiming to conclude the trip some time in the afternoon. The scenery on the way out promises to be different to what we have seen so far and the drive not too hard. This is a perfect setting for the last day. 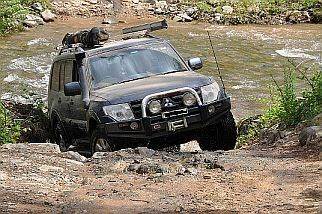 On your High Country 4wd tag along tour Australian 4x4 Tag Along Tours supply a fully equipped support vehicle with recovery equipment, satellite phone, personal locator beacon and first aid equipment.